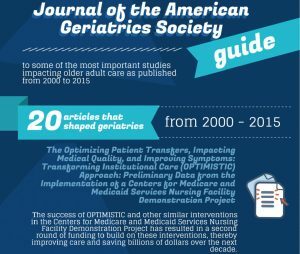 INDIANAPOLIS – The OPTIMISTIC study, an innovative program developed and implemented by clinician-researchers from the Indiana University Center for Aging Research and the Regenstrief Institute to prevent unnecessary hospitalizations of long stay nursing home residents, has been recognized by the Journal of the American Geriatrics Society as one of 20 articles published from 2000 to 2015 that have shaped the field of geriatrics — the medical care of older adults. The article honored by the journal, “The Optimizing Patient Transfers, Impacting Medical Quality, and Improving Symptoms: Transforming Institutional Care Approach: Preliminary Data from the Implementation of a Centers for Medicare and Medicaid Services Nursing Facility Demonstration Project,” was published in Jan. 2015 and focuses on the first years of the initial phase of OPTIMISTIC. In addition to Dr. Unroe and Dr. Sachs, co-authors of the honored study included Laura R. Holtz, B.S. of the IU Center for Aging Research and the Regenstrief Institute; Ellen Miller, Ph.D. of University of Indianapolis; Susan E. Hickman, Ph.D., of the IU School of Nursing; and Greg Arling, Ph.D., formerly with the IU Center for Aging Research and the Regenstrief Institute and now with Purdue University School of Nursing. All continue with OPTIMISTIC. OPTIMISTIC is one of 7 demonstration projects nationwide funded by the CMS Innovations Center through the Initiative to Reduce Avoidable Hospitalizations among Nursing Facility Residents. The authors of “Influence of Studies Published by the Journal of the American Geriatrics Society: Top 20 Articles from 2000–2015” wrote that selection of a study as one of the top 20 articles was based on study objective, relevance of the findings, and effect on current practice.